Honestly, I was disappointed by this book. I went into it with high expectations and they crumbled. 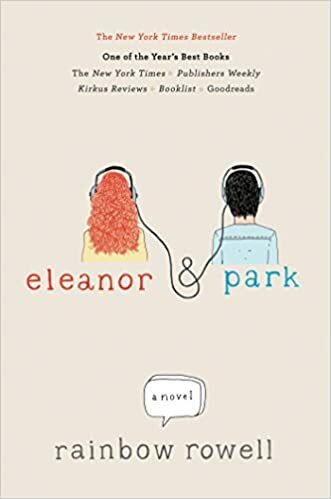 I didn’t feel as connected to the characters as I would have liked, and while I liked Eleanor and Park as a couple, I didn’t feel the relationship as much as I wanted. It was an alright read, but it didn’t sweep me off my feet or anything. I really wanted to like this book, and I feel like maybe I need to reread it because I must have missed something since I seem to be the only one who didn’t get it. This story takes place over the course of one school year during 1986. Eleanor is the new girl at school and she meets another misfit named Park. They both know that first loves very rarely make it, but are brave enough to try. Page 59. So I have to be honest, I started this book off disappointed. Everyone talked about how good this book was and said that the writing was amazing. I went in with these high expectations and I just didn’t see any of it. Until page 59. I’m not sure why page 59 but that was when I realized this book was alright and I started enjoying it. Eleanor. She was such a unique main character. I feel like lately the trend has been to have these beautifully dressed, out-spoken, main characters, and Eleanor wasn’t. She was just herself. She’s broken, she has this awful life at home, and life is just rough for her. I just wanted to hug her and fix everything. Eleanor and Park. I felt like their relationship was really natural, and I like that they didn’t immediately like each other. I also found it so sweet how they knew that if they could just see each other all of the problems in life would fade away and for a moment they could be happy. Park’s mom. I loved Park’s mom. At first I didn’t, but once she started kind of taking Eleanor in under her wing, it was just so sweet. And I just loved her overall personality, and that fact that you could tell who really ran the house. The ending. I have a love/hate relationship with this ending. I won’t say what happens, but if you have read it you know what I’m talking about. It needed to happen, even though you didn’t want it to. However, I feel like the very last paragraph of the book brings hope for Eleanor and Park. I liked it. Personally, I had an issue with the language in the book. The f word is used, which I can kind of look past, it’s hard to avoid these days. There is also some vulgar phrases, I understand they were put in there to prove a point, and I get that, I do. However, the characters were always misusing the names of God, and not just in a OMG kind of way. That bothered me, but I’m not letting it change how I rate the book. Yes, I would say it’s PG-13, and when there is physical romance, it’s not what I would call graphic. I’m having a hard time explaining how it’s done really. Maybe, I didn’t but I know a bunch of people who did. Just don’t go into it with crazy high expectations like I did. Most people liked it, I just didn’t. Rainbow Rowell you can check out her website here. Click the links below to some of her social media sites. Get some really cute Eleanor and Park merch here. Were you let down by this book, or is it just me? Thanks! I’m glad I’m not the only one who feels this way, haha.